I read the J. M. Cohen translation of this work. The below quotes are taken from that version. My General commentary on this book is here. “I have resolved on an enterprise which has no precedent, and which, once complete, will have no imitator. My purpose is to display to my kind a portrait in every way true to nature, and the man I shall portray will be myself. This seems the perfect introduction to Rousseau’s self-portrait. This work was one of the first autobiographies written and may have been the first in modern form. Thus, Rousseau calling it an “an enterprise which has no precedent” is accurate. The portrait of himself that he paints is also nontraditional. Rousseau is declaring his uniqueness here. The question arises, however; is he saying that his own individuality is but just one example of selfhood in a world where everyone is unique? Or is he declaring that he is a special case in a world populated, at least in part, by individuals who are not so unique as he is? I think that the answer is not entirely clear from the text. The narrative paints a picture of the author as a very different person from the average. However, it also describes a world where there are a lot of odd and dissimilar individuals. Rousseau is not a character commonly described in literature. For instance, he is not the heroic type. Though he describes many hardships and injustices meted out to him, these ordeals characterize the author as something of a victim. Though at times he is seriously persecuted for his opinions, many other slights that he complains about are petty enough to remove any sense of a noble struggle and at times give the impression of whining. Furthermore, as I discussed in greater detail in my original post, the narrative is full unconventional relationships with women, further deviating from traditional literature. Thus, we have a picture of a very unusual personality and life. We live in a period of time where autobiographies are being produced in droves. Both mainstream and social media are brimming with people extolling and championing their individuality. Often this falls into the territory of self-absorption and narcissism. On the other hand, a look at history shows that suppression of the individual leads to human catastrophes, such as communism and other forms of totalitarianism as well as lesser forms of conformity. Individual achievement and its celebration have driven great social, scientific and technical progress. Like many things in our world, a moderate amount of assertion of one’s self and personality yields positive results on the personal and societal levels. When it comes to our modern sense of self, a balance between individuality and community seems to be the optimal course. Thus, if moderate doses of individuality are a good thing, Rousseau’s work can be viewed as a vital stepping-stone in how we humans express and think about these things. To the casual reader this autobiography might not seem so special. However, when one remembers that this work was written in 1769 and may have been the first of its kind, one begins to appreciate how groundbreaking it was. Personally, I got the impression while reading it that I was reading a much more modern book. This is a further indication of how this book influenced thinking for centuries. 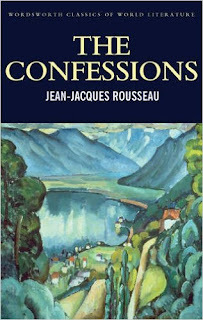 This is a unique book, and Rousseau is a unique character. The opening lines of this work set the stage for pages and pages of distinctness. This distinctiveness helped to shape our concept of individual personality and self. This is but one reason why folks yearn to understand our culture, people in general, and the world at large.